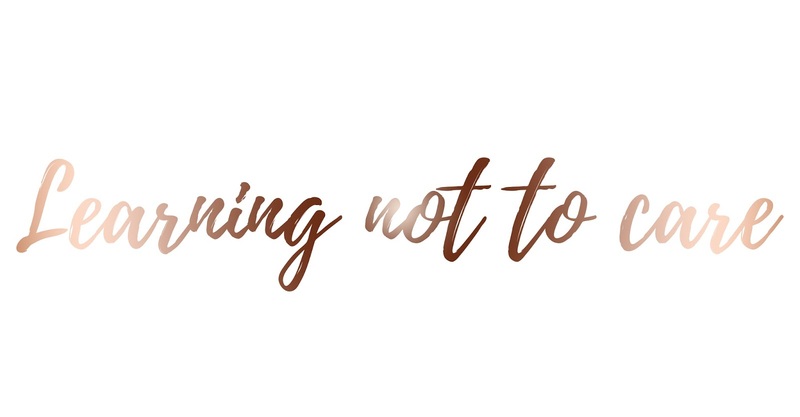 So not only did I create my blog as a place to escape from everything that's going on around me, but I also created my blog as a way to let everything out. Basically like a diary, but instead of having my words sat somewhere where no one is reading them, hundreds if not thousands of people are reading them instead without saying a word; and this makes me happy. People are listening but not talking and sometimes that's all you need. Unfortunately I'm an extremely sensitive person. The smallest thing can get to me, upset me, or make me angry or I can feel a hundred emotions all at once; sometimes you just never know and to be honest, sometimes I don't even know how I'm feeling. But for years now I've known I need to learn not to care, about anything. I know to be happy in this world you need to learn to not give a crap. Yet for some reason, I still care about absolutely everything. I care about how I look. I care about what people say. I care about the useless people in my life who actually mean a lot to me but they shouldn't. I even care about having a tiny chip in my nail varnish; why? I don't have a clue. Recently I was talking to a friend, on a daily basis and to be honest it was lovely being able to speak to someone and enjoy the conversations I'm having with them. However, the conversations slowly began to stop and then for two weeks there were no conversations what so ever. Although I know I didn't do anything wrong, and I hadn't said anything wrong; I still questioned what I had done and why this person stopped talking to me and then started to ignore my messages. And to be fairly honest, I still care now, even though I've felt anger and sadness for something that I cannot change. I've tried to understand the situation and figure out why this had happened, but with constant stressing, I still couldn't figure it out and this person wouldn't tell me. I know I shouldn't care, because if they don't care about the way I feel, or the fact they can just stop talking to me with no issue in the world, then why should I care? Because they clearly don't. But how do you stop caring? Whether this is about the small things or the huge things. How do you become this heartless person I suppose, and feel nothing about anything? What an insightful post! It's just so personal. I think to stop caring completely would be to lose a part of who you are though, so my suggestion would be to try to learn to deal with how your feeling and to control it, if that makes sense? Your friend could be busy, or have any number of things going on in her life that means she's had to put social life on the back burner. I've been going through some similar questions about myself, and it's what's inspired me to start blogging. My first post, How to stop caring what others think of you, may be something you could get some ideas from reading? Sorry, I'm not trying to shamelessly plug, but when I seen you tweet this post it really stood out to me as it's something I'm also writing about. Anyway, I hope you feel better soon. I think you just need to take time to focus on you!